Markets opened in wild fashion after surprising bullish soybean crop progress reports were released at 4 pm. Beans spiked on the open from their close around 1010 back to the highs from last week just above 1030. Corn followed, as did wheat albeit to a lesser degree. From there the market turned very negative and selling ensued all night to where we are right now- beans up 7, corn down 3 and wheat down 3. Not the kind of price action you would look for from a bullish market. Cotton saw a small push last night after conditions in Texas showed a downgrade. Prices in Dec futures pushed on 69, but have failed and trade just above the opening range in the mid-68’s. Wheat prices are something worth noting as well, Minneapolis wheat was up 22 cents at one point last night, its currently down 13 and trading on the lows as I write this. It is amazing to see this kind of pressure applied by the selling forces. Are these spec longs taking a profit? Is this commercial selling? Its very difficult to tell at this time of the year given the lack of SRW harvest activity. Folks up in Montana are just wrapping up winter wheat harvest, after they complete we should be done for the season. The price action does not reflect my opinion very well, but it is hard to not be bullish at these levels. World cash wheat prices are well above last years levels, with Russia putting in a floor near $32 per MT higher than last year. Stocks are high globally, but ex-China we are at levels last seen in 2013. Canada and Australia are having difficult seasons, with Australia entering a crucial period here over the next month with very little rain to show from it. I remain bullish this market and am holding on to bullish positions by a thread at this point. Egypt tendered some offers for wheat this morning, the cheapest came in just above $200 per MT. They were buying in the low 180’s consistently a year ago. There are obviously some bearish factors at play, considering the spring wheat and KC wheat price action but I remain bullish at these levels until the Spring wheat crop can prove carryout are going to be above 100 mmt. rainfall there. I would advise against selling breaks, I think we see another run up into the low 4’s given the weaker dollar and the fact acreage for corn should fall in South America given the stronger real. Brazilian producers are not profitable at these levels. Yield guess still have a wide range. 165-166 seems to be the guess right now, but that is a leap in my opinion. There is no reason why the market can’t trade with a 162 in mind. August WASDE will not show that in my opinion but the market may get some expectations in the next few weeks if things do not change. Weather is not changing right now. versus 61% the previous week, coming in well below expectations. From the US perspective this is the second worst soybean crop in the last decade (2012 is the worst)The big surprise was an 8% drop in IL GD/EX rating to 59% (corn was up 1%!). 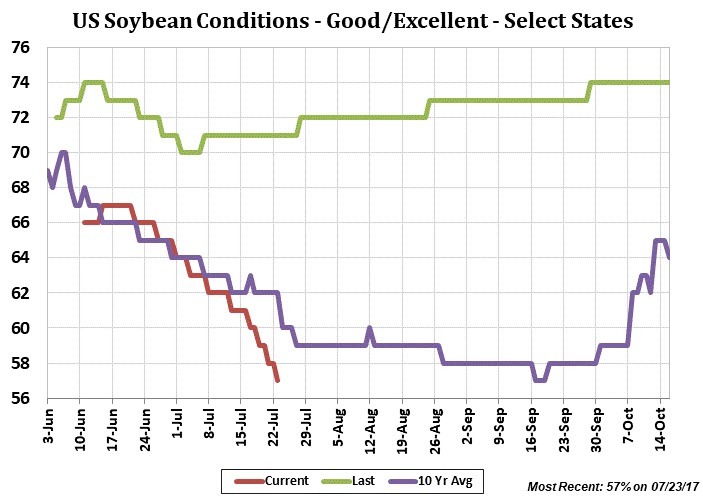 Last night’s selling can not be ignored, the short term upside for soybeans through harvest remains limited to the high 10’s in my opinion, but it is a sleeping giant beyond 2017. Funds remain relatively flat in their interest given now, but at some point they are going to wake up to smaller world numbers and a US crop taking supplies back to levels seen a few years back. Short term sellers should look at anything above 1030, look to buy breaks into the 980’s. 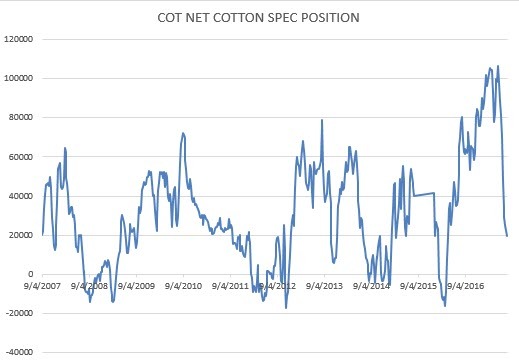 Cotton conditions saw a sharp drop yesterday along with another drop in exchange stocks. GE ratings for the US came in at 55% vs 60% last week and 52% a year ago. Texas crop conditions fell to 45% GE from 49% last week. Conditions in cotton continue to flail about, giving little indication of a story anywhere. There are small problems everywhere but no real big issues we find. 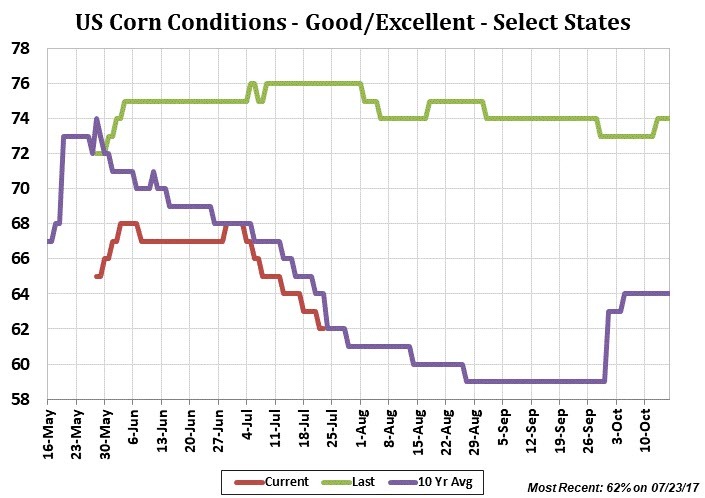 The lack of fund length in this market right now combined with poor growing conditions in Texas over the next week have me thinking we could see a resumption of the recent up trend. These should be viewed as hedging opportunities. IF you rolled into Oct puts near 66, look to roll up on a 3 to 1 basis. Meaning, move the 66 put to 69 or 70 if you can do it for 1.00. 3:1 should be fairly easy while a 4::1 roll will probably need a move over 70. The game plan would be to roll puts for now and look to sell calls later to recoup the costs.